Light is a term that is usually referred to as the part of the solar radiation, which is visible to the human eye. This part is only a very small part of the overall radiation power of the sun. From the so-called electromagnetic spectrum, some rays do not even reach the earth's surface. The electromagnetic spectrum includes ultraviolet radiation, infrared radiation, X-rays, microwaves and radio waves. 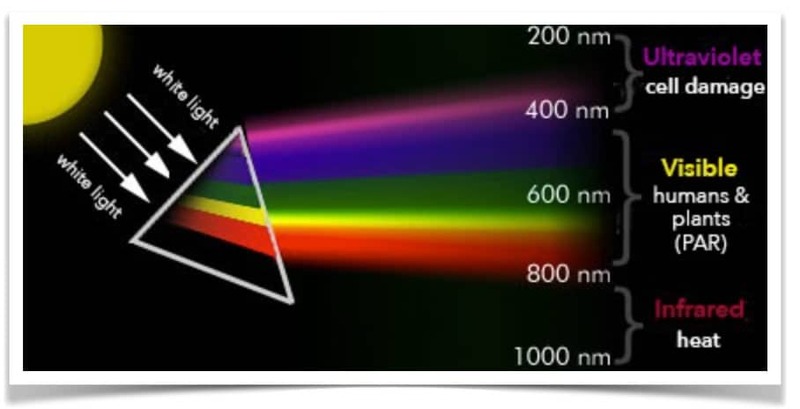 Our light is the smallest segment of the electromagnetic radiation and includes the seven colors of the rainbow in the visible range, which to us is from 380 to 780 nanometers (nm). When putting all colors together, the light appears to be white for our human eye. Light can also be split into colors, when pointing light through a water droplet or a glass prism: the best known example is the rainbow, in which the light is reflected from the water droplets in the air. There are several ways to measure the light. Well-known measures such as lux and lumens are intended for the color vision and light sensitivity of the human eye. Plants are known to have a different perception of light than we humans do. The so-called photosynthetically active radiation, today has established as the most important indicator in the industry and is abbreviated as "PAR". PAR is used by plant scientists and describes the part of the light that is useful for plants to grow. PAR basically refers to the range of light from 400-700 nanometers (nm). PAR is NOT a measurement unit, as it just indicates that the light between 400-700nm is needed for supporting photosynthesis in a plant. Concluded by scientists, however the concept of the Photosynthetic Active Radiation has a fundamental flaw: Wavelengths under 400 nm (in particular UV-A & UV-B) and greater than 700 nm (far red), are excluded from the PAR measurement. The photosynthetically active radiation assumes that all photons outside the region are not used for photosynthesis and plant health. However, plants use light outside the PAR, such as infrared, which increases the hormonal support as well as the photosynthetic efficiency (Emerson effect). UV light plays an important role in the pigmentation of the plants and the formation of substances for the defense mechanismsThe most common units for measuring PAR are PPF (Photosynthetic Photon Flux) and PPFD (Photosynthetic Photon Flux Density). PPF is a measurement of the total PAR light emitted by a grow light and is expressed in µmol/s (micromoles per second). One micromole corresponds to 602,214,150,000,000,000 photons. PPF is a very important measure that tells us how many photons (light particles) are emitted by the light source every second. The PPF, however does not express how many light photons are falling onto the plants as it just accumulates the total output. PPFD measures the light photons that are emitted over one square meter per second and is expressed in µmol/m2/s (micromoles per square meter per second). This is typically the number that is shown to you on a handheld PAR meter. PPFD is the most important number for growers, as it shows the average light level on your grow space. The PPFD does express how many light photons are falling onto the plants, but one single PPFD measurement will not give you the number for your whole growing area. PPFD readings can vary depending on the size of the grow light. Individual PPFD measurements just below the grow light are not very meaningful. Every grow light might have incredible PPFD values straight below the lights. Therefore it is essential to measure the PPFD values on the growing area at different spots, in order to calculate an average, which will give you the a reliable picture whether the grow light is effective enough to bring the photons straight onto all of your plants. 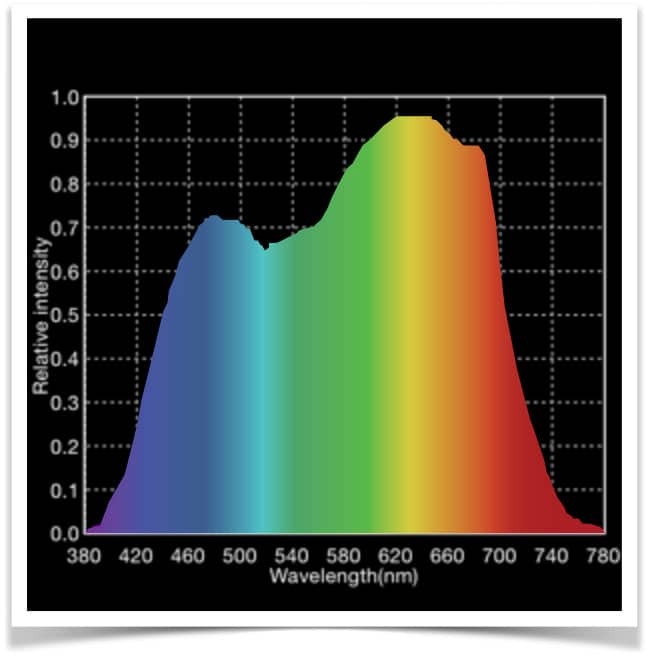 PPFD measurements are also dependent on the height of the light source. To put it simply: the greater the distance of the grow light, the more coverage, but the lower the intensity will be. It is therefore important to know from which distance the measurements were taken of the light source. Only by measuring PPFD values over the entire illumination area and at different distances above the canopy, a useful comparison between grow lights can be made. Having the PPFD number does not mean that the plant will be growing to an optimum. PPF/PPFD measurements in fact are not accurate, as they do not give information on the relative intensities of specific wavelengths. Two well-known scientists (McCree/Inada) have put together the optimal growth spectrum, which shows the effect of light quality on photosynthesis. The relative Quantum Efficiency Curve is also referred to as the Yield Photon Flux (YPF) curve or sometimes the McCree curve and is widely used to evaluate the effect of light quality & quantity on photosynthesis. The curve shows that orange and red photons between 600-630 nm result in 25% more photosynthesis than blue photons between 400-540 nm. Therefore taking a PAR measurement of 100% blue light would still result in significant PPF/PPFD values. Just because a grow light has high PPF/PPFD values, does not mean that plants are growing well. Therefore the spectrum needs to be taken into account. 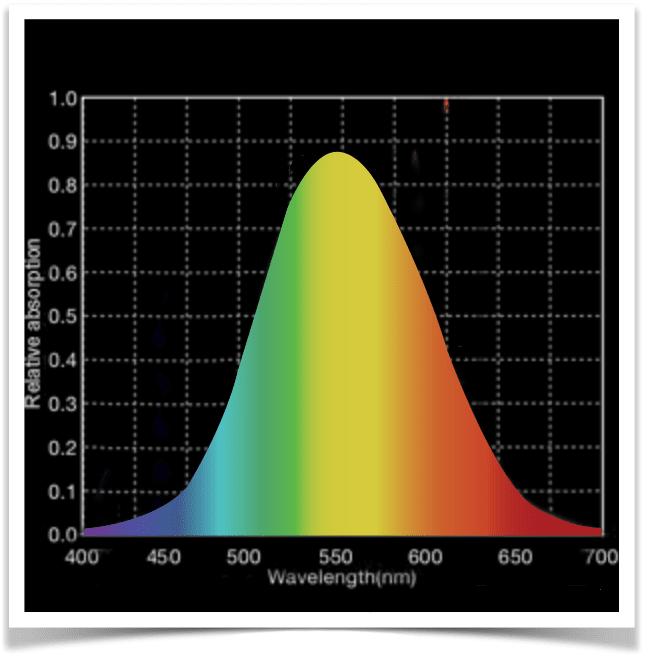 Lux and lumens are measurements tailored to the perception of white light to the human eye and thus have no tremendous effect on photosynthesis. Lux and lumen values are the best results when assessing how well an office space is illuminated. Lux expresses how much luminous flux on a certain area meets. One lux exists when a luminous flux of one lumen illuminates a square meter of surface evenly. The human eye is very sensitive to light in the yellow region of the spectrum. In such a lux / lumen measurement, 100 photons of yellow light achieve a higher rating than 100 photons of blue or red light. Therefore, these measurements are not suitable for our purposes.